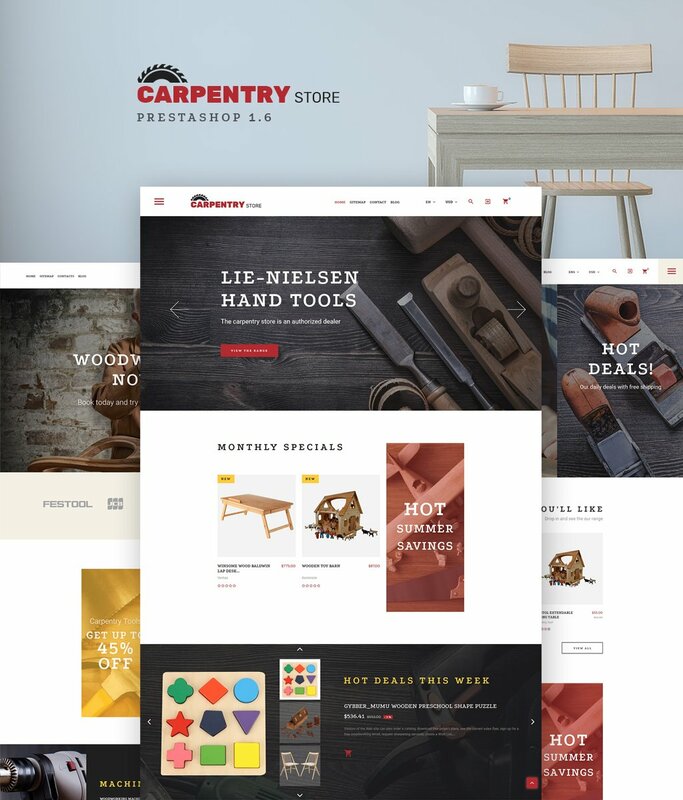 Try the Carpentry Store PrestaShop Theme to create the successful online shop for passionate woodworkers. In this theme, we have gathered the unique set of features to make the process of installation and customization for you quick and easy. Carpentry theme will let you run a multilingual store thanks to its support for several languages and currencies. Exclusive modules give you the opportunity to optimize your online store to its full extent. Leuendano – Real Estate Agency PrestaShop Theme is a fantastic combination of top-notch functionality and modern design. A wide range of UI elements allows you to add all necessary content to your real estate site with minimum efforts. You also get 22 premium modules for free to customize your theme and adapt it to your needs. With the help of TM 360 View module, you can create 360-degree views of your products and give your visitors the ability to rotate them in any direction, and you can showcase your wares in their entire splendor. We believe that there is no person on Earth who doesn’t dream of a warm, cozy house or apartment. So, the good news is that the number of your customers is unlimited. But how to make them buy from you? Real estate demands considerable investments, so the users become rather fastidious during the process of its search. They view thousands of premises. Of course, their tours are virtual because real search make take too long. So, if you are in real estate business, a solid, trustworthy website is a must have. Choose this professionally done template to begin with and start selling more houses. Each real estate agent knows that getting into this business requires good promotion of your skills or agency you work with. To perform it successfully, you’ll need a professional site that is all about buying, selling, and renting real property. The theme you see will help you build such web presence at no extra cost for hiring the designer, creating a sketch, finding programmer, etc. Bringing the latest news, hot offers, specials and top sellers to the attention of visitors, it will get you more deals to strike. A modern and userfriendly website based on this theme will be the best recommendation for the audience to choose your services. Clean and user-friendly layout of this Flooring Store PrestaShop Theme is intended to bring your site’s products to the forefront. Clear content hierarchy and well-balanced layout structure allow the users to scan the page effortlessly and find the desired content in a glance. On top of that, the navigation bar was made fixed to the top. In that way, the users can reach the rest of your site’s pages with a click. This theme was developed for modern furniture and interior stores. It has a sticky drop down menu, which makes the process of navigation through website’s pages a breeze. Beautiful HD images impart the layout of Interior PrestaShop Template a highly professional look. Animation effects make the web page interactive. They enhance main navigation as well. Company products are presented in slider which saves the space on the page and allows you to feature as many items as you wish there. Product images are supplied with stickers and hover effect. Functional buttons become visible only when you put your mouse cursor over them. This home decor PrestaShop template boasts a clean, easy-to-navigate design, which feels quite cozy due to its light texture. With the help of an elegant slider, you can display some of your items in use. To make your inventory presentation more interesting, there is a section with the product of the day next to slides. Furthermore, the template features a newsletter signup form shown as a popup and duplicated one more time at the bottom of the layout. Visitors can also find social media options there, particularly Facebook Like Box, Twitter Feed and follow icons. A furniture PrestaShop template for an eCommerce website can become a great basis for other projects as well. Any online shop of any scale could benefit from its elegant design with a Parallax effect, a drop-down menu with a banner, a product carousel and the Google maps which point out the destination of the shop to your customers. Pay attention to the categories listed at the bottom of the template, as being mentioned on the website twice, they are more likely to get a bigger conversion. Besides, there’s a great way of emphasizing a specific product by placing it on the product carousel. Quintix is a responsive cookware PrestaShop theme perfect for selling items to international customers. They can choose the necessary currency and language via built-in switchers in the header. Compared to a traditional dropdown menu, a mega menu allows for better organization of product categories. You can arrange them in columns and add a product image, banner, and even some text. To show items, the theme makes use of carousels keeping the marketplace cleaner. By means of tabs, buyers can distinguish among popular, new, best-selling, and special items. When building the layout, feel free to choose from 3 header, footer, and homepage versions. Furnitta is an Outdoor Furniture PrestaShop Theme designed and crafted specifically for an online store selling exterior furniture, decorations, and supplies. This template features TM Mega Layout module which allows you to tinker with its blocks and create a unique homepage that will fit your tastes like a glove. The parallax scrolling effect will make your visitors go ‘wow’, while the slider section will highlight the most important information and attract everybody’s attention to it. Customers will enjoy the Ajax Search that can save them a good deal of time, and with a Newsletter Subscription Pop-up built-in, they will turn into loyal clients in a twinkle. Decorma is a bright and stylish theme compatible with PrestaShop 1.7. By means of a mega menu, you can easily create complex menus with multilevel layouts and enrich them with banners and videos. Thanks to a quick view option, customers can get detailed information about the product and take a closer look at its image. What is cool, there’s no need to enter a new page. Implementation of Ajax technology lets customers rapidly add products to the cart without page reload. The module of product badges offers an easy way to emphasize different kinds of goods, e.g. new arrivals or best-sellers. Ristorme is a template of great navigation and impeccable functionality, which are provided by 14 innovative TM modules. It features all you need for an unforgettable on-site experience. Choose one from 3 premade layouts, or create your own with Mega Layout Builder to reach the unique look and feel of your site. For your online store to be profitable and user-friendly there are a number of payment gateways, clients can choose one that is suitable for them. Multilingual and multicurrency support will help you to expand your target audience and obtain new clients from all around the world. Decorma is a godsend for those who have subtle perception of beauty. Interior Decor PrestaShop Theme was crafted exclusively for interior design and furniture, home decor and furnishings online store. Its minimalist and modern appearance is underpinned by bright colors, which will catch the eye right away. Insert stunning images and drive attention to the product you are proud of with TM mosaic product view. Increase impulse purchase rate with TM Related products, it provides for remarkable showcasing of your merchandise. Dream to showcase your furniture store in the best light? Create a top-notch website for your modern furniture shop with this Furniture Outlet PrestaShop Theme that has everything to make your site rock! Choose from 3 ready-made variants of your theme with TM Mega Layout and feel free to play with the color palette of your site with Theme Color Switcher. TM Ajax Search, TM Ajax Cart, Multilingual, and Multi-currency support will not only provide your clients with a comfortable shopping, but also make your site far more reliable and user-friendly all over the world. Leo Framwork flexible and easy use. With Leo Theme Cpanel module you can put position module and sort order everything in your site. Leo Express Decor is template in this October . The eCommerce responsive Leo Express Decor Template for Halloween celebrated and it is a great choice to sell all goods such as Gift Shop , Decor Shop , Tool Store ,Instrument store and more. WhitePetal Prestashop Responsive Theme is designed for fashion, jewelry, cosmetic, beauty, women and furniture stores. WhitePetal Prestashop Responsive Theme is looking good with colors combination. All sub pages are customized. It is very nice with its clean and professional look. Pts Summnershop is a multi purpose responsive theme to build any store: Fashion, Gift, Digital, Decor, Furniture, etc. Furniture Prestashop Responsive Theme is designed for furniture, decor, woods and home decor stores.